While the Services have similar eligibility requirements, they may also reserve the right to enlist recruits using criteria that are based on the needs or vacancies of the current mission. The general requirements listed here apply to the U.S. Military as a whole. For specifics, please contact a recruiter. A Military Entrance Processing Station (MEPS) medical section supervisor describes what happens when recruits undergo their physical exam while at a MEPS. Diane Mahalco: My name is Diane Mahalco. I'm the medical section supervisor. The purpose of the medical examination is to make sure that the applicant is medically sound to enter into the Military. After they check in with processing, they're ushered down the hall to the medical session. They check in. We do their blood pressure. We do their vision test. We do a hearing test. Then they're sent over to the brief to complete all their paperwork, make sure their Privacy Act statements are signed, the HIV forms are signed. After that, they're given the commander's brief, the medical section brief, and then they're sent back over to medical, where they have their blood drawn for HIV, and then they give a urine specimen for a drug screen. After that, they see the doctor. Male and female exams are a little different, basically the same as if you were to go to your family practice. The female exam includes a pregnancy test. The females, you know, take a little longer. Then the males, basically, the males are all in one room, females one on one. Speaker 2: What you'll be doing now is some orthoneurological maneuvers. It'll feel like we're testing your exercise ability, but we're really not. If anything that we ask that you do hurts or makes you feel lightheaded, short of breath, that sort of thing, take a break. It's not disqualifying to do so, and we certainly don't want you leaving here injured. Diane Mahalco: If they are disqualified for a medical reason, the Services can opt to give a waiver for that disqualification, and that's usually the case. The duck walk, that's what everybody remembers, you know. The prior service people come in, and they always, you know, tell the applicants about the duck walk. My favorite part is seeing the applicants, when they're told they're qualified, you know, they're very happy. They're relieved, and you know, that just makes it all worth it. Service members who work at a Military Entrance Processing Station (MEPS) describe how new recruits are processed for their background checks. Speaker 1: Good morning, everybody. I'm Sergeant First Class Ketcham. I'm the operations NCRC here at the Boston MEPS. I'm going to talk real quick about biometric enrollment. We did this this morning when you checked in, on your first visit at the MEPS. Yeah, when they first arrive here at the MEPS, we do biometric enrollment on all the applicants. Basically, we're going to take their fingerprint. We use their primary finger, which is usually their right hand. And we'll also do a backup finger on their left hand. And then we're going to take a photo of them, which intakes 20 different points on their face. Once we get them into the database, all they have to do is show up at a station, get a copy of their fingerprint and, you know, that identifies them. And it's also a security measure because if somebody tries to come in and that's not the person, we use another finger that's going to tell us that as well. So it's going to keep all the applicants safe as well. OK, once you're done with that, you need to come see the folks in processing, all right? You need to be open and honest with them when they sit you down there. Speaker 2: You'll see during your visit here at the MEPS that the biometric process is the first step. We'll also be processing your fingerprints, disclosing any involvement you may have had with law enforcement. They're going to ask you about 14 questions. They're going to ask you about speeding tickets, involvement with authorities. If you have any court cases open or closed, anything that you need to tell them, you need to make sure that that is documented. OK? Is that understood? Speaker 2: Committing to obeying the orders of the president and the orders of the officers that they fall under, and also their adherence to the Uniform Code of Military Justice. These are important concepts for them to understand, and that they will be held to a higher standard than people that they've gone to high school with. Military and service academy minimum entrance age requirements are 17 with parental consent or 18 without parental consent. Service academy applicants must meet the age requirements as of July 1 of the year of entry. Physical requirements vary greatly across each Service branch. 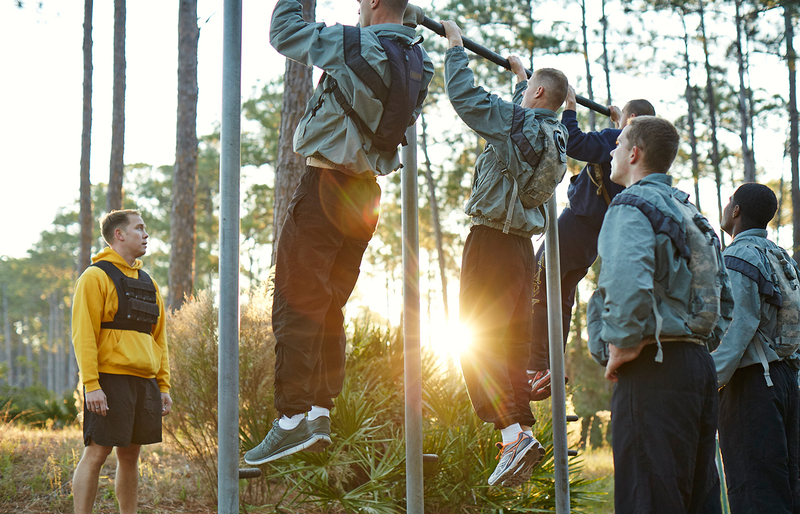 Generally speaking, potential recruits should be in good physical condition, of appropriate weight and able to pass a standard physical screening prior to entry. For specific information, please contact a recruiter. Success in any branch of the Military depends on a good education. A high school diploma is most desirable. Candidates with a GED (General Education Development) certificate can enlist, but some Services may limit their opportunities. It is very difficult to be considered a serious candidate without either a high school diploma or an accepted alternative credential. U.S. citizens or Legal Permanent Residents (people who have an INS I-151/I-551 Green Card) may join the U.S. Military. For more information about citizenship, visit the U.S. Immigration and Nationalization (INS) website. For almost all male U.S. citizens and male aliens living in the United States who are ages 18 through 25, there is a requirement to register with the Selective Service.